Since yesterday was the first day of fall, I figured we better celebrate! This snack mix is a perfect way to enjoy the flavors and colors of fall. It would be fun to put on your desk at work to share with your coworkers. It would be great to set out for people to munch on during the football game. I little baggy would be a special treat in your child's lunch box! No matter how you decide to serve it, it won't take long before it is gone. It is like a magnet that keeps drawing your hand in for another bite! Look at all those goodies, how could it not be wonderful?! I thought it would be fun to mix a couple of my fall favorites. Jenny's Smacky Delicious Mix and hillbilly hash seemed like they would be a perfect pair. While we were at it, why not add in some Reese's Pieces too? I mean really, you might as well! A few pumpkins and some s'mores candy corn? Sure! 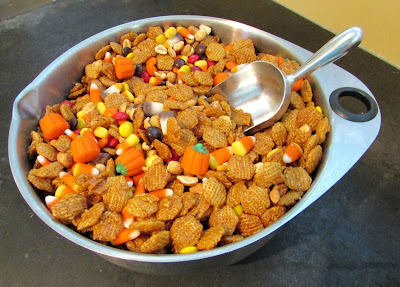 While we are on the topic, does everyone call candy corn and peanuts hillbilly hash or is that a regional thing? If not hillbilly hash, what do you call it? There really isn't much of a recipe here, but I had to share it anyway. I also had to share the results for fear the whole bowl my disappear before my very eyes! This would be a PERFECT movie snack. Beware though, it is super addicting! This looks like one addicting snack! It is, that is for sure. I had to quickly package it up and get it ready to go to its intended recipients or it might not have made it through the afternoon! Yum Carlee this is such a cute idea! 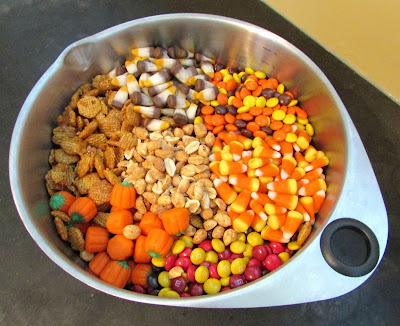 I love these types of mixes that you can throw together and this is perfect for the season for sure! Thanks for sharing with us at #ThrowbackThursday! I love them too, people are always drawn to them and they are so easy to make. The only problem is that I am drawn to them too! I may have eaten a little too much of this today! I love all of the goodies in this snack! It would have me munching until it's gone! Me too, that is the only problem with it! Yum, looks like a fun fall snack! It has been a big hit! Nom-Nom!! What a delicious mix for snacking. Thank you for sharing with us at #HomeMattersParty. We would love to have you again next week. It is really snackable! Thanks for hosting, see you next week! My husband would love to have this snack to munch on while he's driving! Hillbilly hash?? Nope, haven't heard that name, but I just might start using it for fun! It's a fun name! It seems I have heard it called a few other things, but I can't recall any of them. 'Tis the season though, so I am sure my memory will be refreshed soon! This is such a neat idea and sounds so delicious! Thank you, it disappears pretty quickly that is for sure! I've got a mix similar to this sitting in a glass canister on my kitchen counter. It tastes great and makes a pretty fall display. I need to add some Reese's Pieces to mine! I've never heard candy corn and peanuts called hillbilly trash. I don't think I've heard a name for it, but that's a funny one. It is a funny name! I always think it is fun to see what the regional names/slang for things are. So far it seems like I'm the only one that knows it by that name, but I promise I am not the one that came up with it! What a great snack! I think this would be perfect for our next family movie night. My son likes to close all the curtains, turn up the speakers, and play "movie theater." This snack mix will be a great surprise in place of popcorn. Thanks for sharing at Inspiration Thursday! That would be so much fun! I am looking forward to having family movie nights. My little guy is two and doesn't sit still for that long yet! Thank you, it is a fun one for sure! I've always been a fan of the Hidden Valley Ranch chex mix that my aunt used to make. Thanks for sharing your recipe at the #AnythingGoes Link Party. That is a good one too! My mom makes one like that with extra dill that is super delicious! Thanks for hosting! Thanks for sharing at #OMHGWW--always good to have a snack recipe! It's nice to have something to set out when people are over! This is a popular one! 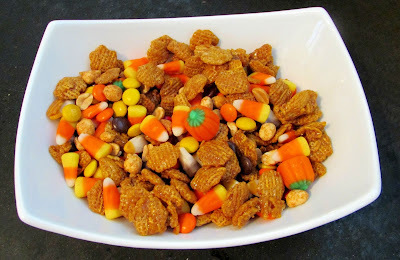 This is a great fall snack mix, we will love it. Thanks so much for sharing with Full Plate Thursday and have a wonderful day. I love munchy foods like this! The only problem is it is hard to keep track of how much you've had. I hope you are having a great week!